Melt butter in a 12 inch skillet over medium high heat. Add onions, bell pepper, crushed red pepper and black pepper to the pan. Sauté over medium high heat till onions start to turn a golden color (3 to 5 minutes). Lower heat to medium then add garlic and salt. Cook and additional minute. Remove pan from heat. Drain Maraschino Cherries and chop. Add chopped Maraschino cherries and heavy cream to pan and stir to combine well. 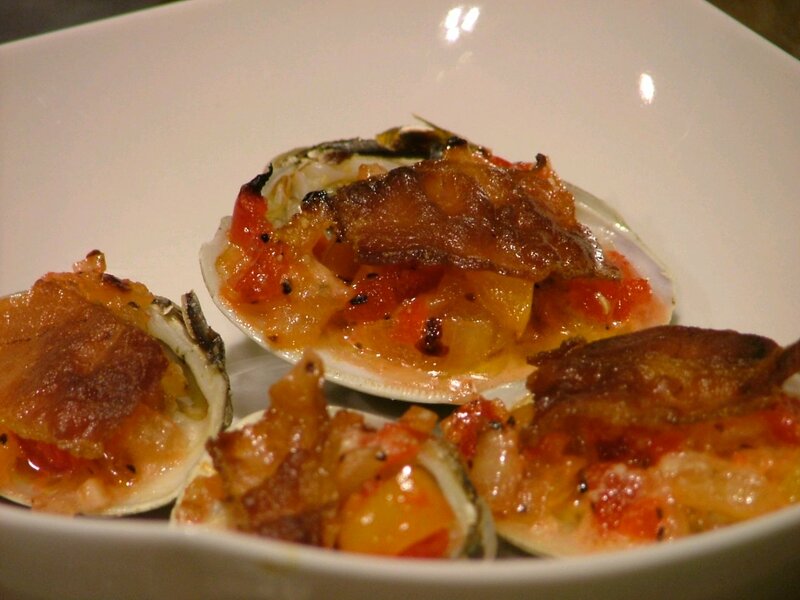 Open clams; remove from shell and reserve. Wash deep half of the clam shells (remaining clam shells may be discarded). Place washed clam shells onto a shallow pan (15X 11inch or large enough to fit all clams). Place each reserved clam into a clam shell. Top with a heaping teaspoon of the cherry mixture. Then sprinkle with grated parmesan cheese and top each with a quarter slice of bacon.